I attended the Commercial UAV Expo in Las Vegas at the end of October. I gave a talk entitled “Mine Site Mapping – One Year In.” This talk was on our experiences with performing mine site mapping services with our AirGon Services group. Our services group is primarily about Research and Development (R&D). We use our engagements with mining companies to discover the products that they need, accuracy levels and, most of all, how to reliably create these products. These experiences inform both the development of our technology (the MMK, Topolyst, Reckon, the BYOD Mapping Kit) but also help us develop best practices for both collection and processing. In every case, the customer desired a site orthophoto. In fact, they usually want an ortho of the entire site with analytic products of a subsection of the mine site. I thought in this month’s section, I would review these products from the acquisition and processing point of view. I have written a few articles about injecting a priori data into a mapping project. 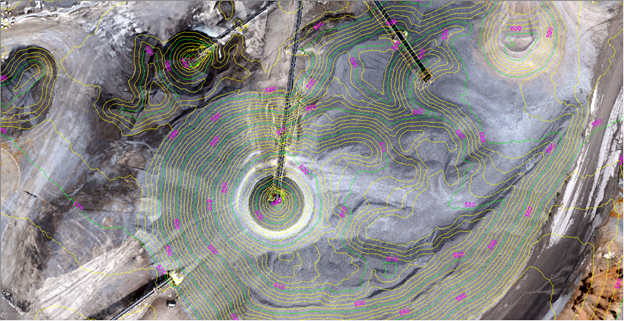 This is the situation where, at some time in the past, the customer has done a site survey and wants to use these data as the bottom surface of stockpiles. Their primary desire here is for consistency from inventory to inventory. An example of this, a large limestone quarry that we fly, is shown in Figure 1. Here baseline data as well as a reclaim tunnel model have been provided to us as a DWG data set. The illustration of Figure 1 shows these data being used by Topolyst to create a 3D base surface. The primary challenge that we have when receiving a priori data is the accuracy of the data. We often find that these data were obtained by traditional stereo photogrammetric collection techniques so we do not have a point cloud from which to assess accuracy. Now, done properly, stereo photogrammetry produces survey grade data. Unfortunately, much of this a priori data was collected with the surface obstructed by existing stockpiles; in other words, it was not a stockpile free base data mapping. This means that the stereo compiler had to estimate locations under the existing data. We find that in most cases, these estimations are simply linear interpolations from one side of the obscured area to the other. We often find these bottom models extending above the current surface. It is difficult to tell if the data were incorrectly modeled or if the ground has actually changed from the time the baseline data were collected. A second big challenge we have with these data are a lack of knowledge by the provider as to the exact datum to which the data are referenced. We are often concerned with elevation differences of just a few centimeters. The Geoid model really matters when you are approach survey leveling accuracy goals. We have found, on more than one occasion, a priori data with an incorrect vertical model. This usually occurs (at least in the USA) as a result of using the incorrect NAD83 to WGS84 transformation. Over the past year, we have added a lot of refinements to how Topolyst handles this a priori data. Those of you who do LIDAR or photogrammetric processing will immediately recognize this as the problem of introducing “breaklines” and “mass points” into a model. LP360 (Topolyst is just a variant of LP360) has always been a very strong product in terms of breakline modeling. We have added a few features in this area to improve the modeling as it typically applies in UAS mapping. We are now at the point where we really do not have any software issues with this sort of modeling but the interpretation problems will always remain. Here the customer is interested only in the volumes of the piles, without regard to location. The deliverable is generally a spreadsheet with volume, material type, density and tonnage. Of course, our customer deliveries are via our cloud data platform, Reckon, so we want the toes to be correctly georeferenced. If you leave out the correct georeferencing (meaning you compute the volume of the pile but do not necessarily try to align it with an existing map), you have the sort of processing offered by a myriad of web-based solutions such as Kespry. Under this business model, you typically upload the raw drone images which have been georeferenced by the navigation grade GNSS for x, y and the drone barometric altimeter for elevation. This typically provides horizontal accuracy on the order of several meters and vertical accuracies at about 5 meters. So long as the camera is properly calibrated, this methodology leads to volumetric accuracies that are accurate to within about 5%. We never do these projects without some check points. These are surveyed image identifiable points that we use to check horizontal and vertical accuracy. The biggest issues we have encountered with this type of project is the definition of the stockpile toe – it is somewhere between comingled piles, it traces along an embankment such as the pit, the stockpile is in a containment bin and so forth. 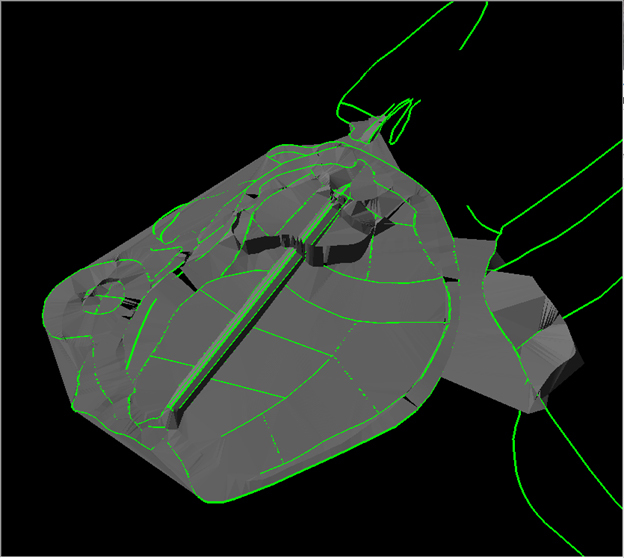 There requires a lot of careful toe editing in a three dimensional visualization environment such as Topolyst. We never have issues with accuracy because we always fly with a direct geopositioning system. For our MMK, it is a Post-Process Kinematic, PPK, GNSS system. For the senseFly eBee, it is an onboard RTK system. We always lay out some checkpoints for project verification. A very clean mine site with stockpiles sitting on a surface is nearly non-existent (except in our dreams). While you sometimes encounter sites where you can just manually draw a toe, these sites are nearly always at inventory transfer locations, not working mines. In fact, of all the mine sites we have surveyed, we have encountered only one “groomed” site (see Figure 2). Even at this site, the upper left and lower right piles required some disambiguation (wow, that’s a big word!) work to separate the pile edge from encroaching vegetation. A surprising number of customers want contours. As you know, these are elevation isolines at a particular interval. Most customer want either 2 foot or 1 foot contour intervals. These data, in DXF or DWG format, are used as input to mine planning software. I find this a bit odd since I would think by now that this downstream software would directly ingest a LAS point cloud or at least an elevation model. Contours are always absolutely referenced to a datum (a “Network”). This can be a local plant datum or, much more commonly, a mapping horizontal and vertical datum such as a state plane coordinate system for horizontal and NAVD88 with a specific geoid model for vertical (at least in the United States). You can tie to the datums using either direct geopositioning with onboard RTK/PPK or you can use dense ground control points. I personally would never collect data that must be tied to a datum without having a few image identifiable checkpoints. Unfortunately, this means that you will need at least an RTK rover in you equipment kit. A good rule of thumb for contours is that the accuracy of the elevation data should be at least three times the accuracy of the desired contour interval. This says if you are going to produce 1 foot (30 cm) contours, you need 4” (10 cm) of vertical accuracy relative to the vertical datum. When you measure your checkpoints, don’t forget to propagate the error of the base station location (which you might be deriving from an OPUS solution). Preparing a surface for contour generation is perhaps the most tedious of mine site mapping work. It is generally the only site mapping you will do that requires full classification of ground points (the source for the contour construction). An example of 2 foot contours within a mine site is shown in Figure 3. Sites with a high degree of vegetation in areas where the customer wants contour lines will have to be collected with either manual RTK profiling (very tedious!) or with a LIDAR system. You simply cannot get ground points with image-based Structure from Motion (SfM). 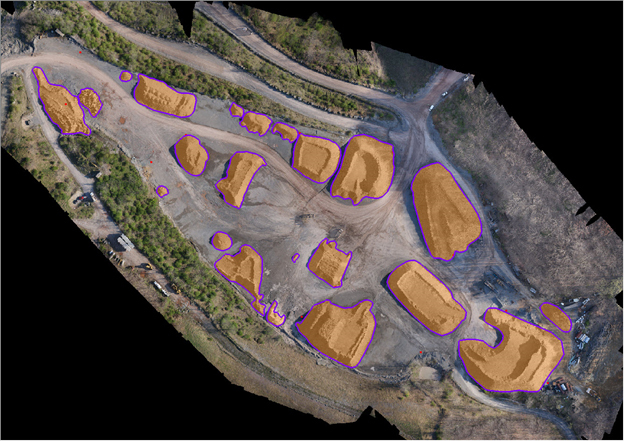 No surprise here – this is why LIDAR was adopted for mapping! If the customer does not want to pay for LIDAR or manual RTK collection, the vegetated areas should be circumscribed with “low confidence” polygons. You can either exclude the contouring completely from these areas or classify the interior to vegetation and let the exterior contours just pass though the region. In any event, the customer must be aware that the data are quite inaccurate in these regions. The SfM algorithm gets quite “confused” in areas with overhead “noise” such as conveyors and vegetation. This confusion (actually correlation errors) typically manifests as very low points. You will need to find and clean these points prior to contour generation. Product generation for UAS mapping requires a lot of front-end planning. This planning needs to be product-driven. If you customer (you, yourself, perhaps) needs only volumes with no tie of the toes to a datum, you can get away with no control so long as some other information such as camera calibration and flying height are correct. By the way, we recommend never collecting this way since you are precluded from doing any meaningful time series analysis. On the other hand, most meaningful data (that is, you can quantify the accuracy relative to a datum) will require a very careful control strategy as well as a rigorous processing workflow with the right tools (meaning Topolyst, of course!). No matter what geopositioning strategy you employ, you should always have some independent methods for verifying accuracy. If all of this seems a bit daunting, you can get assistance from us. Remember, our services group is really our R&D lab. Our real goal is to sell technology to owner/operators and production companies. No matter what drone you are using, you can always avail of our consulting services. We have gained a lot of experience over the past few years, mostly by first doing the wrong thing! Save yourself this time and money by engaging with us!